One of my 2011 New Year’s Resolution’s was to become more active. Oh, sure I was working out 2 or 3 times a week. But my resolution was being more aggressive with my workouts and attempt to jog. Gasp! Did I say that?! I am by no means a jogger. Jogging was for those who participated in marathons or on a track team. It was definitely NOT for me. Last summer, when I purchased my Wii Fit program, one of the optional exercises is jogging. For months, the other exercises kept an increasing tally of times I would do a particular one. But none of the running/jogging options had been touched. I was against the thought of jogging, and I was not about to take part in the real act of jogging. Time passes and November crept along, so did my curiosity. Surely, it isn’t that bad…right? I mean each exercise on the Wii Fit started easy and as I increased my time and ability, a new level would unlock. None of the levels started at some outrageous challenge so surely the jogging would follow suit. So I decided I would at least attempt to jog. I first made sure no one was home. That last thing I needed was for a child to see their mother jogging while resembling something between jello and Santa’s belly. The nightmares it would have ensued are unimaginable! Then I cleared the living room floor and turn the floor fan on low. I clicked the jogger option and braced myself. Only it wasn’t horrible. In fact, it was to jog around half of Mii Island–where the Miis of the Wii live. That wasn’t so bad, I thought as I finished the lap in about five minutes and a new level became available. This time it was to jog around the entire island–which translates to jogging about ten minutes or 2 miles. My jogging resolution needed some readjustment now that I met my goal within a few weeks. I really thought it would take longer. But I found the more I jogged, the more I enjoyed it, and the more I looked forward to it the next day. Insane, right? While paging through the Wii Fit options, I discovered another jogging challenge named “jogging free style”. 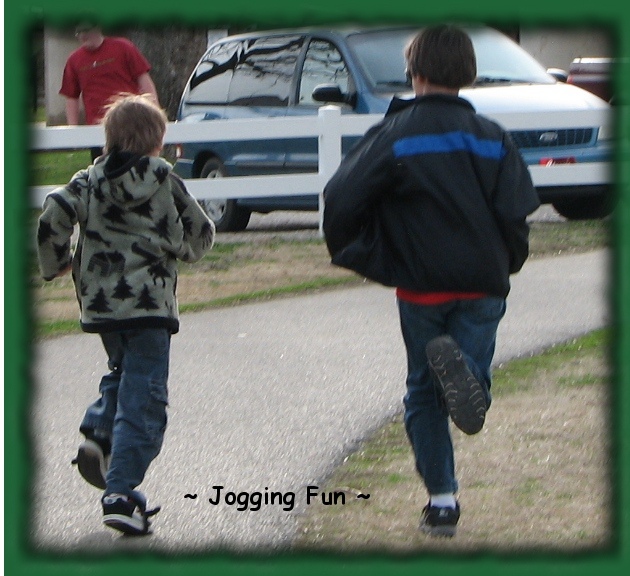 This jogging activity times the jog for ten minutes. Which opens up a twenty and thirty minute challenge as each stage is completed. Not bad, not something I was willing to mess with at the time and so my regular ten minute jog schedule stayed in place. By the beginning of March, I convinced myself the ten minute free style jog should be attempted as I was already jogging the same amount of time. I jogged for ten minutes while surfing through the television channels and before I knew it, time was up. Hmm..okay, that wasn’t so bad. Let’s try the twenty minutes. The following Monday I set the Wii up to countdown twenty minutes of jogging. As I finished the jog, other than being a little winded, I felt great. I knew my legs would be a little sore due to jogging, but surely the benefits out weighed the pain. Who was it that said “no pain, no gain”? I’m sure they knew what they were talking about. Even with the obstacles of life–pneumonia, kids, full-time employment, kids–I was able to keep up the regiment I set out for myself. Minus the week I was sick, I have not missed more than 2 days in a row of jogging. And when I do miss it, or it gets shifted due to work schedules, I notice the difference in my mood and how I feel. Now to this evening, when I ran across Sara’s blog. I could not turn my back to the event. Here is a simple WP-wide challenge right up my alley. Though I do not jog outside in public, I do jog inside the house and can easily jog the set goal amount of 3.1 miles. However, if it’s a beautiful day, I will simply be power walking with my daughter down along the river.